Han Xiao is a Chinese artist whose beautifully mangled portraits are abstract depictions of the human psyche itself. Han Xiao was born in LiaoNing province China. 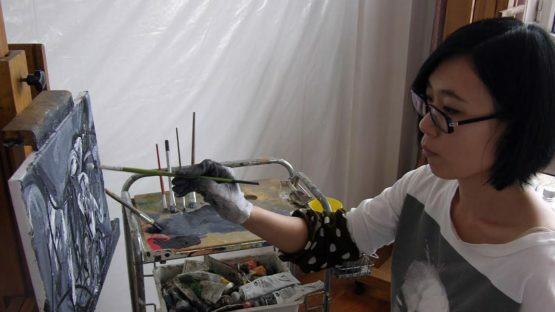 During her study, she had received an affirmation and encouragement from Shi Chong, a department director of Tsinghua University Academy of Fine Arts. After graduation from Academy of Fine Art & Design of Tsinghua University, she worked as a design assistant at Design Group and a high school teacher. During this period, she became inspired to pick up a paintbrush for the first time since she was a small child. Her portraits possess an innate sense of loneliness and anxiety, and are reminiscent of Francis Bacon’s paintings. She deliberately blurs out the faces of her subjects and makes it difficult to discern any identifiable features. Her energetic and highly impastoed brush strokes and rich color palette of vibrant blue, ochre, green, and pink illuminate her canvases and ask the viewer to linger. The major themes Han pursues include life, conflict, confrontation of odd shapes in the social environment, and the contradiction behind the reality. She draws a range of subjects, including her lover, friends, mother, animals, models, students, or herself. Her art is the real one, drawn from life, and her works often has a kind of loneliness and faint anxiety. Han Xiao is currently living in DaLian City, China.